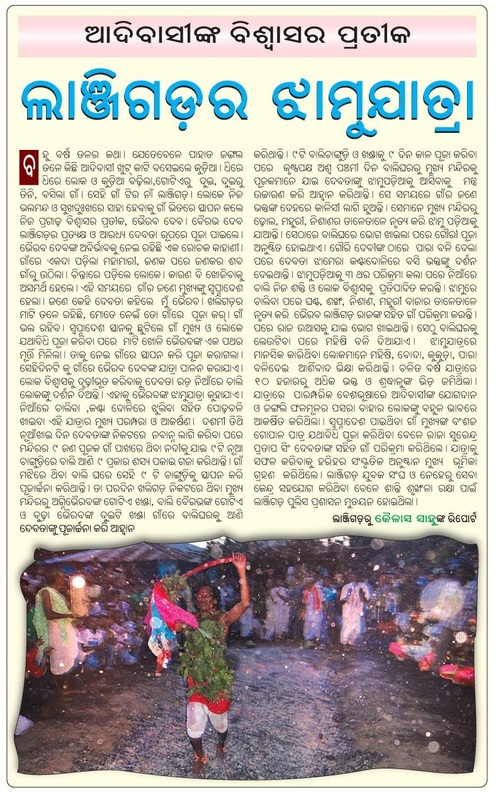 Balangir: The Paharia tribals living in remote villages of Nuapada district have a unique way of celebrating Nuakhai. They offer liquor and meat to their presiding deity before having the new crop. The eldest member of a Paharia family worships the deity called the Duma and makes the offering. “It has been our tradition to offer meat and liquor to the deity before partaking the new crop. After this ritual, all community members congregate at one place to join the feast,” said Satrughan Paharia. “Except this, all other rituals are same. It is the eldest member of the family, who gives the new crop to other members. Other communities offer only the new crop,” said Sriram Paharia. The Paharias are concentrated in Bargaon, Bhainsadani, Katingpani and some villages inside the Sunabeda sanctuary. Sources said the places where Paharias reside have turned into a Maoist den. The Paharias have been fighting for Primitive Tribal Group (PTG) status, which will help in their development. They would benefit under some special schemes too. The following screen shot is taken from http://www.propoor.org/search/details.php?type=npo&npo_id=19524. 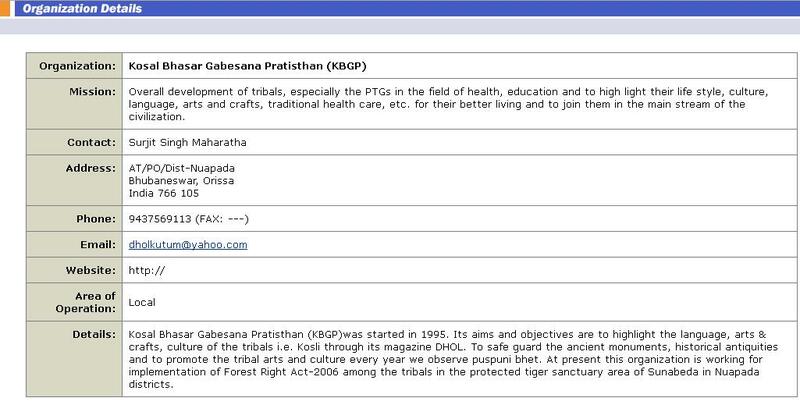 As far as I know, this is the only non-government organization dedicated for the research on Kosli language and culture of western Odisha. 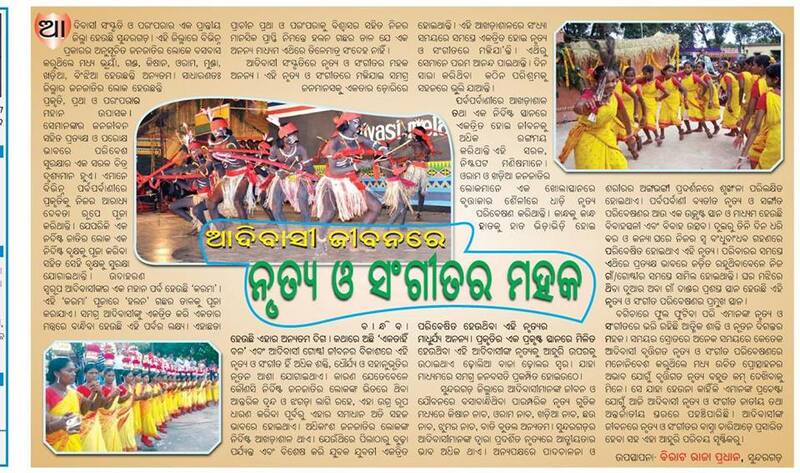 It is constantly highlighting and promoting Kosli language, arts & crafts, culture of the tribal’s through its magazine “DHOL”. There is a deliberate attempt by the Government of Odisha to suppress the Kosli language and culture, alleged Kosal Kranti Dal (KKD) working president Baidyanath Mishra at a Press conference here on Wednesday. He said teachers and para-teachers are being recruited to appease the minor ethic groups, including Bengali and Telugu, in the State whereas Kosli spoken by almost one and a half crore people is neither given official status nor is any step being taken for its growth due to a high degree of inferiority complex on the Government’s part. Mishra said thousand of books in Kosli using Odia script have been published in different branches of Kosli literature, but the Government does not have any affirmative stance for promoting the rich literature. This “step-motherly attitude” towards Kosli, coupled with acute regional imbalance and other parochial considerations, has led to discontentment among the people concerned and a strong opinion to split the State. “The recent activities of the Government and some NGOs have posed a threat to Kosli language and culture,” he alleged and called upon the people of ‘Kosalanchal’ to remain alert. The strategy of “Utkalisation of the Kosal areas” is a calculated one, but the Government has not been successful in the past nor would it be successful in future because of its ill motive as negative action would only bring negative result, he remarked. Mishra was launching Kosli No-1, a music album brought out by Karan Raj and his young team. Congratulating all those involved in the project, he advised them to adopt the twin strategy of promotion and safeguard for their language and culture. Editor of Paschimanchala Surama Mishra was the guest of honour on the occasion. Sagar Singh Manki, Ram Chandra Amat, Jai Singh Singh and Hrudanand Behera were among others present. Thanks to Dr. Chitrasen Pasayat for sending me this article. Click here to read the article.